Spiced rum, ginger beer, and lime make a great drink! Although I can’t sit here long enough to write about some new foods we have been eating around here, I can write a little bit about one of my current favorite drinks… A Dark & Stormy. So, so good. Crisp and refreshing as we head into the summer! 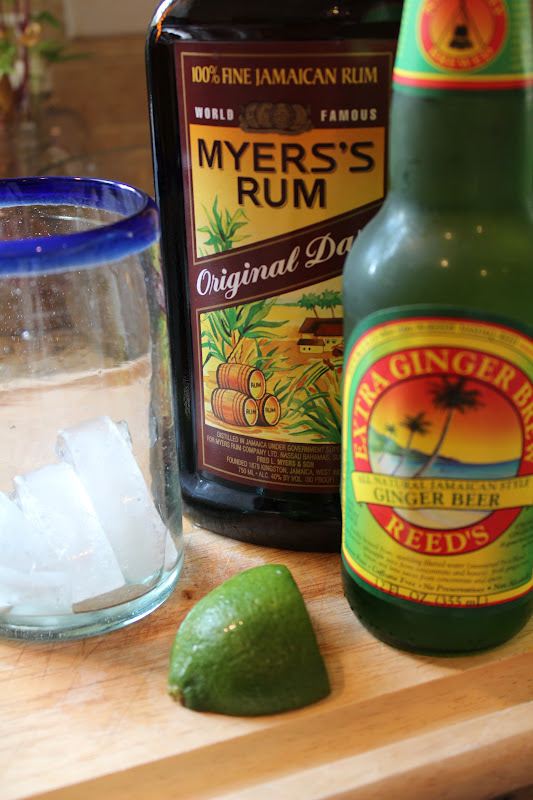 This drink requires just a few ingredients … spiced rum, ginger beer, and fresh lime. Such an easy combo! My aunt Charleen introduced me to ginger beer many, many years ago and I was intrigued. Ginger beer is like a stronger, ginger-y version of ginger ale. Some people do not love it. I do. Very much so. It can be tricky to get your hands on ginger beer. My local grocery store, Harris Teeter, does not carry it so I need to scurry over to Earth Fare and cross my fingers that it is in stock. Or, if I am feeling adventurous, try to brave the parking garage by Trader Joe’s and pick some up there. Next time you are wandering your favorite specialty grocery store, look around for it. It is usually sold in 4-packs. Dark & Stormy – Cheers! Fill your glass partway with ice. Squeeze the juice of 1/2 a lime over the ice. Add the rum. Finish with the ginger beer. Stir. Enjoy!! Erin, I have an easy recipe for homemade ginger beer. It’s absolutely delicious, and very simple. I’m about to start a fresh batch. Would you like the recipe? Erin, here is the recipe for Ginger Beer. You will need fresh ginger root, sugar, the juice of 2 lemons, and water. Once the bug is bubbling, it’s time to make the ginger beer. Boil 2 quarts of water along with two inches of ginger root for mild flavor (or up to six inches for intense flavor), and 1 and 1/2 cups of sugar. Boil 15 minute,s then cool. Strain out the ginger, add the lemon juice, and add the strained ginger bug. ( If you like, keep a few tablespoons of the bug to feed towards another batch of ginger beer.) Add 1 gallon of water to the ginger beer mixture, and pour the whole thing into a sealable bottle. Leave your bottle to ferment in a warm spot for about 2 weeks. Recycled two-liter soda bottles work well. I like to use them because I can feel them firming up over time, and when they are rock-hard, I know that the carbonation has built up and it’s time to drink. Open the bottle slowly that first time, and have a glass handy. (If you chill it in the fridge before opening, it will be less likely to come rushing out of the bottle.) Store the finished beer in the refrigerator, and enjoy! The fizz will tickle your nose. I found this recipe in a book called Wild Fermentation by Sandor Katz, and he writes that he adapted it from a recipe in Nourishing Traditions by Sally Fallon. We’ve used it for years, and my husband prefers it when he’s been working outside on a hot day. I have substituted pineapple juice for the lemon juice, and it makes a nice variation. Lime juice might be good, too!